A little bit about ReadyGrass..
READY Grass is a new arm of a well-established company, which has been in the landscaping industry for the past 30 years, having experience in both small and major works, domestic and commercial. The team at Ready Grass has been in the business for so many years they’ve seen lots of changes to gardening products and trends. Over the years, the company has seen the devastation from floods, caused, in part, by large areas of paving and concreting, and they are hoping that this new, trendy product can help with that. The forefront of the business today is Ready Grass artificial grass and the business is one of the biggest suppliers and stockists of artificial grass in Merseyside and North Wales, with stock available to take away today! Garden areas to help reduce flooding! Weather you require a small or large area of artificial grass, Ready Grass are the people for you! The company offers a wide range of products to suit any budget, with colours ranging from green to all the colours of the rainbow, for a up-and-coming, trendy new look! Ready Grass artificial grass is practical and requires no maintenance, so no more puddles, spillages, mowing or watering, just a natural look all year round, year after year. It is undisturbed by the British weather. Ready Grass artificial grass doesn’t hold any surface water as it is self draining; rain water passes right through, back in to the ground. Many people choose paving for a maintenance-free garden but did you know large areas of paving can require planning consent Ready Grass doesn’t? Plus some paving will force rainwater to simply run off into the drains, possibly causing an overflow in high rains. 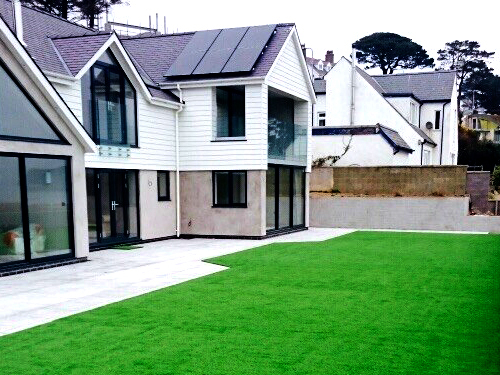 Ready Grass is a local company with an expert team that has been providing quality landscaping for many years in the area and now they want to ensure you receive superior quality artificial grass that comes complete with a UV guarantee. The ‘lawn’ will be installed by a skilled team so you’ll be able to enjoy a maintenance-free garden for years to come. For all you DIY enthusiasts, the company has all stock and materials available to complete the task with free, friendly advice. With all the choices of Ready Grass there is a price plan for everyone and, with local support, the company is aiming to create more jobs for local people.